ClickHole would like to extend our sincerest apologies to Mr. Ron Perlman. We no longer publish lists containing the slider functionality that would help remove these antlers from his head in the following photos, so, unfortunately, they are here to stay. ClickHole’s longtime readers will remember the slider technology we once employed in pieces like this, this, this, this, this, and this. Back then, lists with sliders were shining examples of ClickHole’s fresh spin on aggregated listicles and viral news. But, as time went by, it became clear that sliders were taking up more time, energy, and staff resources than we could afford. We just no longer had the bandwidth to make them. 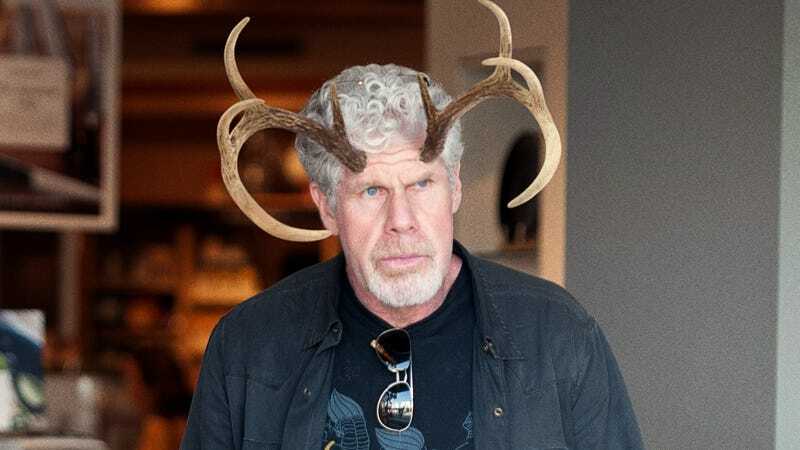 So, unfortunately, we regret to inform both our readers and Mr. Ron Perlman that there is no way to remove the antlers from his head in this photo, and that’s just the way it is now. As nice as it would be to return Ron Perlman’s head to its natural, hornless state, sliders are a thing of the past for ClickHole, and they’ll likely remain so. Mr. Perlman will just have to accept that for the foreseeable future, nobody will be able to move a little bar back and forth across the screen to get rid of the antlers in this photograph. We apologize for the inconvenience. If it’s any consolation for the fact that we’ve quietly retired the slider format, ClickHole is of the opinion that Ron Perlman is still incredibly handsome with the majestic antlers of a 20-point buck. To the millions of ClickHole readers who flood our inbox every day demanding to know when we’re publishing more lists with sliders, we understand how devastating it must be to learn that you may never use a slider on ClickHole again. We wish we could give you a slider so that you could erase the dozens of antlers protruding from every inch of Ron Perlman’s head, but we’re simply powerless to do anything about it right now. Sorry, Ron. These antlers aren’t going anywhere without sliders, and to be completely honest with you, it doesn’t look like we’ll be doing those again anytime soon. You’re stuck with them. You have our deepest condolences.